Easily identifiable and yet iconic in every sense of the word, World Cup jerseys show allegiance and are a source of pride for soccer fans. Nike, Puma, Adidas make the majority, however certain nations do buck the trend with a different label. Read more below. 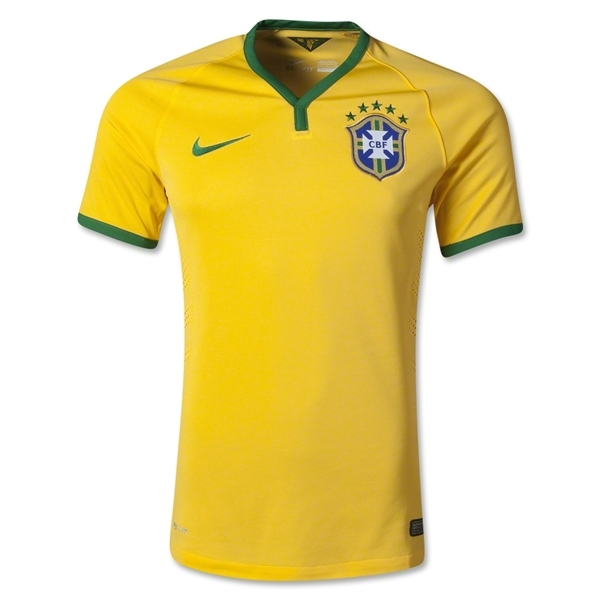 Supplied by Nike, Brazil’s famous Yellow and Green jerseys have received a slight 2014 update with a smaller collar, green cuffs and sharper green numbers. Already available in most online stores, Brazil jerseys are sure to be hot ticket items seeing as how they are the host nation and these kits look damn good. The red/white checks have taken over! Nike’s 2014’s trend of red/white check boxes has continued for the Croats: the sleeves are no longer white only and the numbers in the middle are a muted red with blue outline, unlike in previous years where they were solid blue. While not everyone’s cup of tea, they are amongst the most easily identifiable jerseys out there. They are set to be released for sale in February 2014. Les Tri have a new updated look for Brazil. 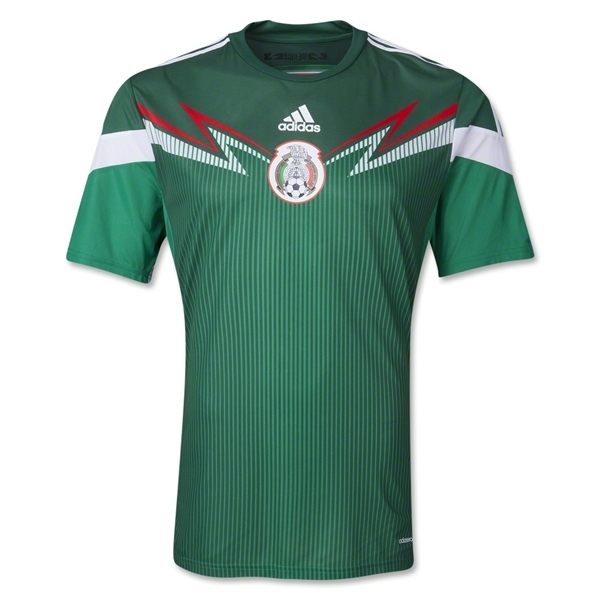 Adidas did away with the classic white number over the right-hand side, with white stripes along the arms look, in favor of a new “lightning” shape that is meant to symbolize “Mexican Power”. The Mexico logo is firmly in the middle, unlike many other national jerseys. Reviews have been mixed, but with such a fervent backing they’re sure to sell quickly regardless. Puma has blended traditional African design on Cameroon’s 2014 World Cup jersey. A much more detailed look than the bland 2010 offering, this new design features three logos side by side across the chest and a pattern across the Yellow(Away) and Dark Green (Home) versions. Still, in terms of pure individuality, Cameroon comes out a winner. These jerseys are not yet available for sale, check back soon. 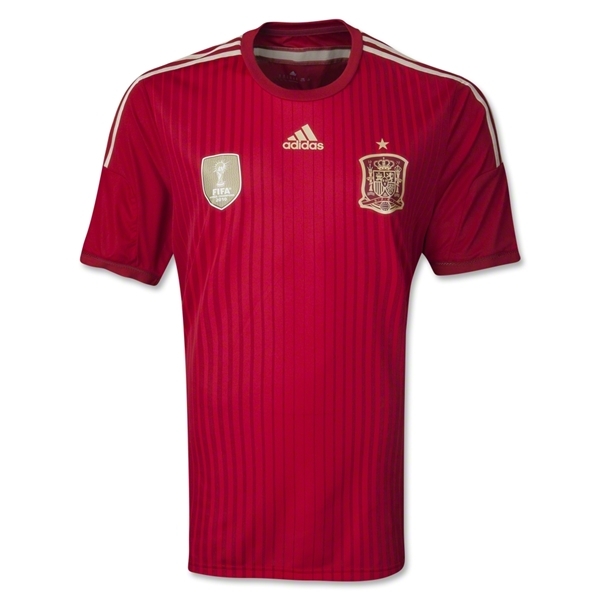 Now available in stores, Spain’s 2014 World Cup kit has done away with yellow and light red in favor of a dark crimson and a beautiful gold detailing. 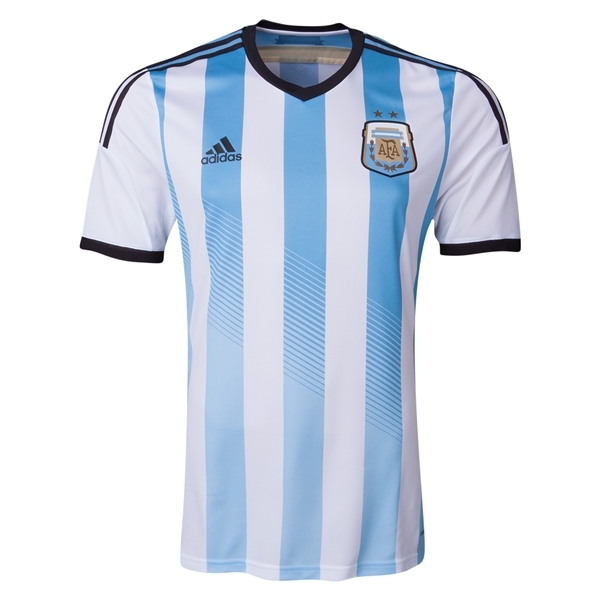 A huge hit with the jersey buying public, this is one jersey we recommend buying, if you can still find it anywhere before the World Cup begins. Holland has gone back to a classic design for the 2014 World Cup. Their new jerseys are not yet available for purchase, but are a familiar orange color, with white logo for the Home, with a snazzy blue fade with orange trim for the Away. For our taste it’s a little too bland, but still hopefully the numbers look better than the “taped on” look of the 2010 versions. 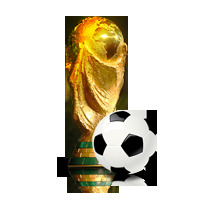 Embracing their national colors of blue, white, and red, the Chilean national jersey for the 2014 FIFA World Cup is rather typical, with a red body, white trim, logo and a blue/white color. They have added a white stripe down the body, so it’s better than the bland 2010 offering, but still it is not one of the better jerseys out there. Chile National jerseys are not yet available for sale. It’s hard to screw up a jersey with a kangaroo on it, and Nike has done a good job moving the green stripe from a horizontal one to a vertical one. It is currently on sale and while its colors of gold and dark green aren’t for all tastes, we give it a positive review. One of the biggest differences from past years, Columbia has marked its return to the World Cup with a snazzy striped Adidas jersey that features multiple diagonal stripes. It is currently on sale for a February shipment, but it is one of our favorites. Not yet released. Come back soon for more details! Despite adding a traditional African design across both shoulders, as opposed to just the right side as in 2010, the Ivory Coast jerseys are a solid orange with white or green with white. One of the few examples of a jersey that actually got worse over the 2010 version. Not yet available for sale. A very similar offering to the 2010 World Cup jersey, the Japanese national jersey, manufactured by Adidas, has added a killer accent in the form of lines emanating from their logo over the player’s heart. Although relatively basic, it has earned great reviews and is one of our favorites as it embraces tradition with modern design. While the color profile remains the same, Uruguay has simplified the design with their Puma designed jersey. The collar has been redesigned and numbers will be light colored. A nice, simple design. Not yet available for sale. Made by Lotto, the Costa Rican “La Sele” World Cup jersey has not yet been released. Stay tuned for more details. Nike has taken over the jersey design from Umbro and done a nice job in making it look a bit more befitting a major contender. They have sharpened the logo and added a nice blue collar to the Home version. England national jerseys are now available for sale. By adding the Italian flag to the cuffs and collar, Puma has designed a beautiful jersey for the Italian national team. They away jersey features beautiful blue stripes as well. While not yet available for sale, as soon as they do become available we’ll take 2 because they are amazing. Not yet available for sale, Switzerland’s jersey is once again made by Puma but has undergone very few changes beyond a sharper red. Then again, when it ain’t broke, why fix it? Not yet available, come back soon for more details! No matter how they play, the French National team always looks good. Nike has taken over the reins from Adidas and created a true gem. Reviews have been overwhelmingly positive, as the simple Blue jersey with white logo and collar really look great. Available for sale now. Created by Joma, the Honduran national jerseys have not yet been released. Come back soon! The only difference is a different colored stripe on the shorts. When you have a jersey this iconic however, change should be avoided. Jersey is now on sale at most online retailers. Not yet released. Check back soon! While not yet released for sale, images have leaked of the new Adidas Nigerian jersey. Contrasting green colors, including a light green foreground on a seafoam background, with gray trimming make it perhaps the most improved of the WC team jerseys. Considering how bland their 2010 jerseys were, Nigeria should be proud of the 2014 product. Adidas has done away with the black vertical stripe and replaced it with an orange/red chevron over the breast. 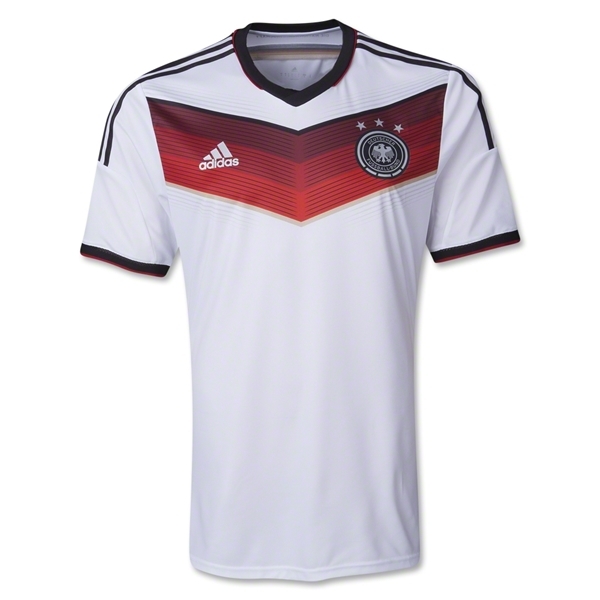 Critics in 2010 said the German national team jersey made them look a tad sinister, perhaps why the 2014 version is more colorful. A little too 1980’s for our taste, but still a good looking jersey. 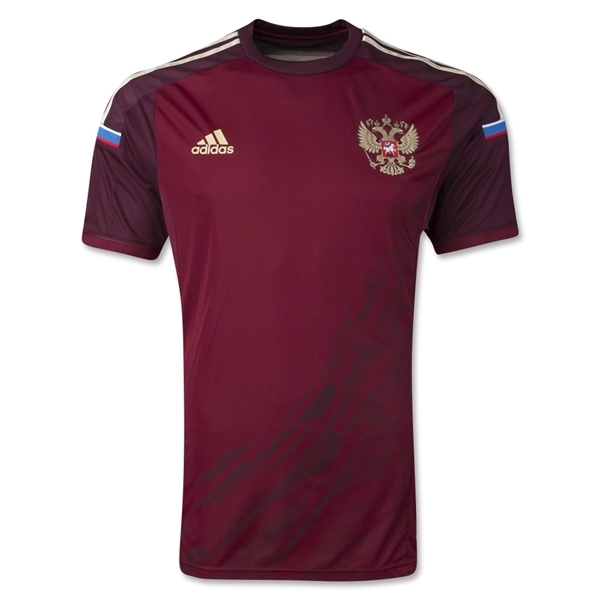 On sale now at the FIFA store and most major online retailers. Nike has simplified the Portugal jersey by doing away with the green “plate” and instead making only the cuffs and colors green. Very simple and classic, it has earned decent reviews, but is not one of the better jerseys when compared to their European brethren. A beautiful African design adorns the new Ghana national jersey for 2014. Puma has really upped the ante on the Home jersey with the pattern lying on the cuffs and inside collar. Along with Nigeria’s redesign, one of the best African jerseys. Not yet available for sale. Check back soon! 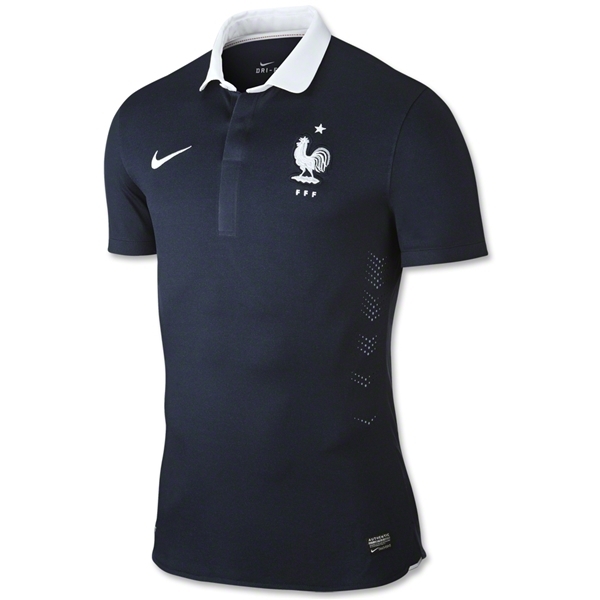 Not yet release for sale, we do know the US jersey will be designed by Nike. Check back soon for more updates! Wow. Designed by Burrda, 2014’s jersey is a huge improvement over previous versions. Featuring a gorgeous logo, swirl chest design and the Belgian colors throughout, it also features the national team logo faded into the background on the lower chest. Very unique and one of our favorites. Available now at the FIFA store. Adidas has done away with the horizontal stripes, in favor of a solid maroon with gold stripes along the arms. The away jersey is a very different white with several shades of blue along the shoulders. According to most reviews, the home jersey looks too much like the Spanish national jerseys, while the Away is just kind of ugly. Jerseys are now for sale on most online retailers and the FIFA Store. Nike has simplified the South Korea jersey to a solid red with blue trim, while the away is basic white with two separate colors (red and blue) for shoulders. Nothing too exciting, reviews have understandably been mixed. Jerseys are not yet on sale. Check back soon!